Author Mary Rivers‘s Newly Released “Mr. Marshmallow” is a Simple Story About Continuity in Family and in Nature. “Mr. 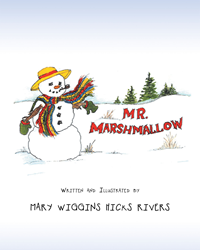 Marshmallow” from Christian Faith Publishing author, Mary Rivers is a sweet tale of a little boy who learns valuable lessons about the natural world while visiting his grandmother. Her gentle reassurances about the continuity of the seasons and the enduring love of family provide understanding and comfort to the child. “Mr. Marshmallow”: a simple story about continuity. “Mr. Marshmallow” is the creation of published author Mary Rivers. Five-year-old Sean awakens to the wonder of freshly fallen snow blanketing the land around his grandmother’s house. He spends hours building a snowman and playing with his new imaginary friend. The following morning, he is dismayed to find that the snow has melted and his friend has disappeared. His grandmother’s gentle explanations reassure him that all good things return in due time. Published by Christian Faith Publishing, Mary Rivers’s new book will delight young readers with its message of continuity and hope. View a synopsis of “Mr. Marshmallow” on YouTube. Readers can purchase “Mr. Marshmallow” at traditional brick and mortar bookstores, or online at Amazon.com, Apple iTunes store, Kobo or Barnes and Noble. For additional information or inquiries about “Mr. Marshmallow”, contact the Christian Faith Publishing media department at 866-554-0919.